Advancing medical technology has produced tests which offer the opportunity to resolve paternity disputes with more accuracy than unaided traditional evidentiary techniques are likely to obtain. Because the biology underlying the statistical evidence in paternity cases offers a wealth of previously unavailable information which is certain to revolutionize the adjudication of paternity suits, but it is important that the courts not become so mesmerized by these new sources of evidence that they neglect to subject them to traditional principles of evidence applicable to all testimony. Additionally, for some time scholars have disagreed on the proper application of a probability formula called Bayes' Theorem to questions of proof. Because the evidence yielded by modern serologic tests is inherently quantitative and probabilistic, questions concerning the use of Bayesian calculations in the trial setting will thus have to be decided in these paternity disputes. This article undertakes a critical analysis of the use of probability calculations in paternity cases and of the broader issues implicit in this growing practice. 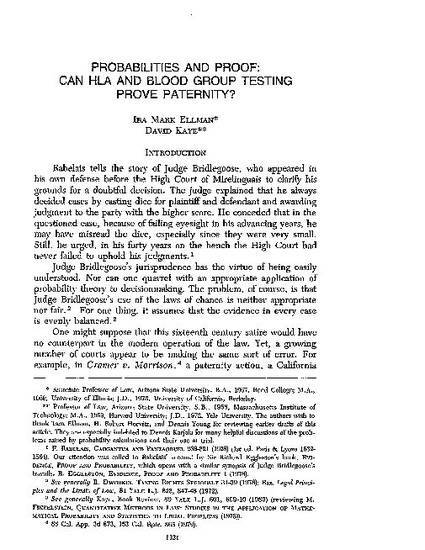 Although the statistical information derived from Human Leucocyte Antigen (HLA) testing should be admissible in paternity cases, the article concludes that no expert, no matter what skill level, can correctly testify to any quantified probability that the defendant in a given case is in fact the father. It reviews the difficulties associated with traditional evidentiary techniques in paternity cases, the nature and appeal of HLA and other modern serologic techniques, and the statistical reasoning which necessarily underlies expert testimony. After reviewing the problems associated with statistical identification evidence, the article concludes by endorsing more suitable alternatives to the methodology currently used in paternity litigation.